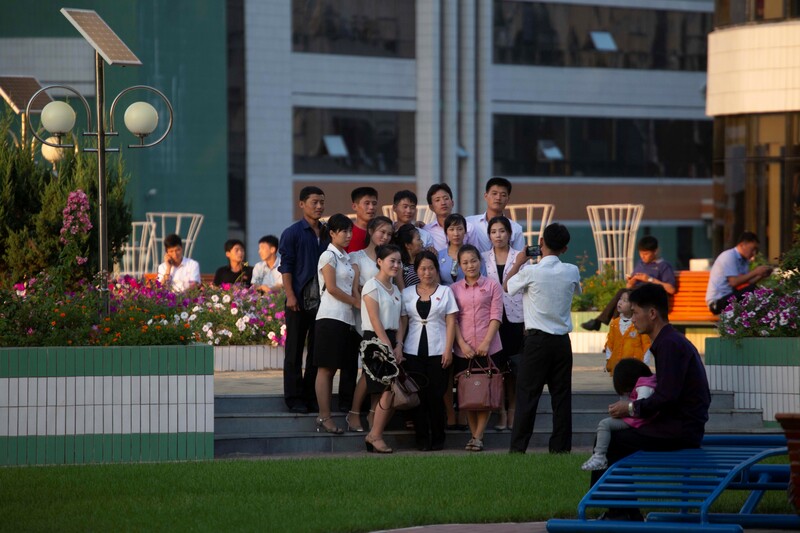 While residents of Pyongyang were busy throughout the summer and especially in the weeks leading up to the September 9 foundation day-related events, many of the millions of people in the city still carried on with a typical, if altered, routine. We know that hundreds of thousands of children, students, soldiers, and workers had to spend countless hours practicing for a military parade, a torch march, and the new mass games. But the city and its economy kept moving, and its residents – parents, grandparents, children, students – still tried to find time outside various holiday-related tasks to go shopping, meet friends, study, work on other projects, and generally work to get by. Some of the photos below take a look behind the scenes of some of the events, while others show Pyongyangites working, playing, and taking care of business. 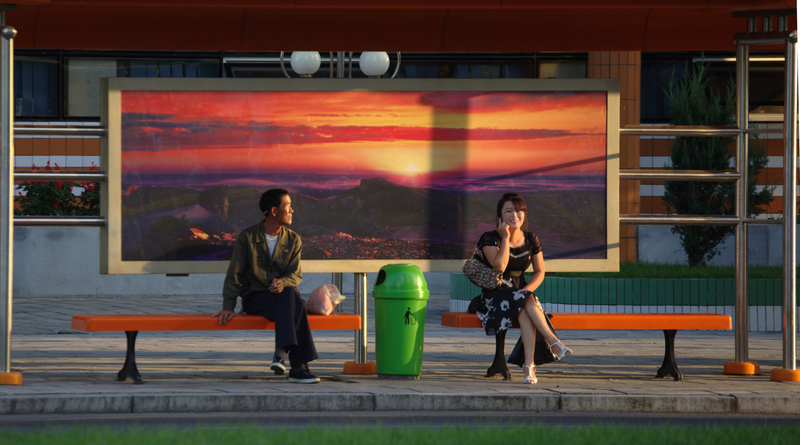 The North Korean capital’s appearance has changed drastically over the past decade, and residents are being seen with more modern technology and expensive personal possessions, but behind these new features are the reminders of bygone eras and, of course, the omnipresent propaganda. The following series thus shows the many sides of Pyongyang, most of which can be seen from its major roads, in images acquired by NK News and taken mostly in early September and late August. 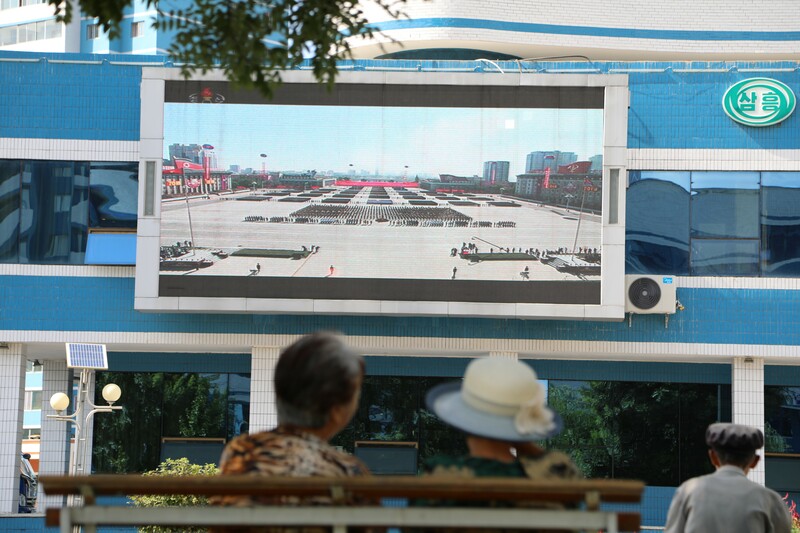 Pyongyang residents watch KCTV coverage of the September 9 military parade on a big screen in the upscale Mirae Scientists Street neighborhood. At least nine KPA soldiers can be seen at Kaeson Gate Square (just below the Arch of Triumph) meticulously managing the job of parking army trucks used during the September 9 parade. Soldiers from various sectors of the North Korean military sat in these trucks when participating in the "after-parade" (after the march through Kim Il Sung Square), smiling and interacting with residents lining the streets. 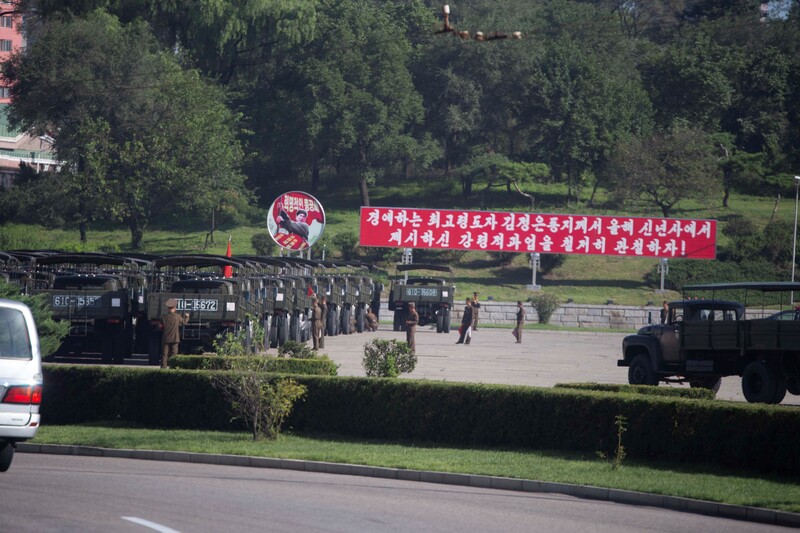 A KCNA video of this event blurred out some of the spray-painted car numbers seen on the tailgates of these trucks. 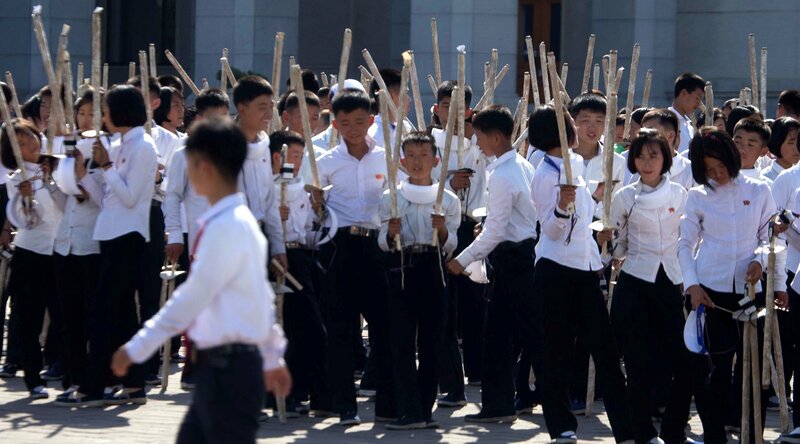 The day after the military parade, a "torch march" took place in Kim Il Sung Square, where tens of thousands of young people ranging from very young ages (as seen in this photo) to university students were made to participate. The shorter children carry longer torches, to maintain an even layer of flames to form the words and pictures during the event. Each child utilizes paper hand guards, though flames could be seen in state media falling to the ground often during running sections. The students here can also be seen holding small battery packs connected to light-up headbands which were used during certain sections of the September 10 event. One young boy even has his collar popped – a rare show of individuality in the sea of "single-minded unity." 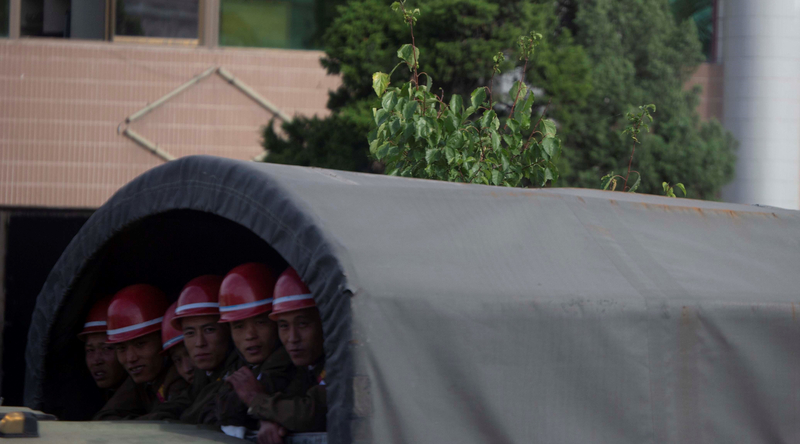 A group of soldiers in red hard hats – an outfit often seen on politically-important construction sites – catch the view outside their transport truck in Pyongyang. 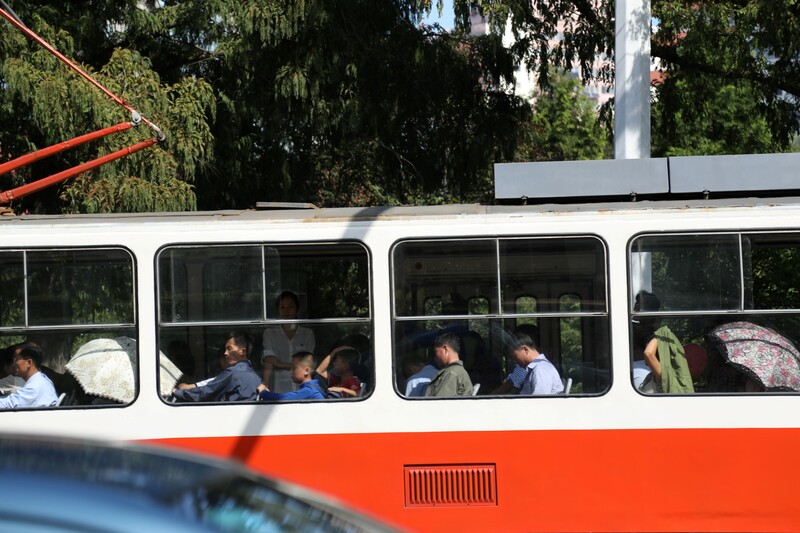 It is common for residents of Pyongyang to carry parasols in summer – even using them to block the sun while sitting in old trams and buses that have not been outfitted with window tint. Another mode of transport prevalent in the city these days is taxis. NK News noticed an oversupply of taxis, however, while in Pyongyang for the September 9 holiday, with the majority observed to be vacant. 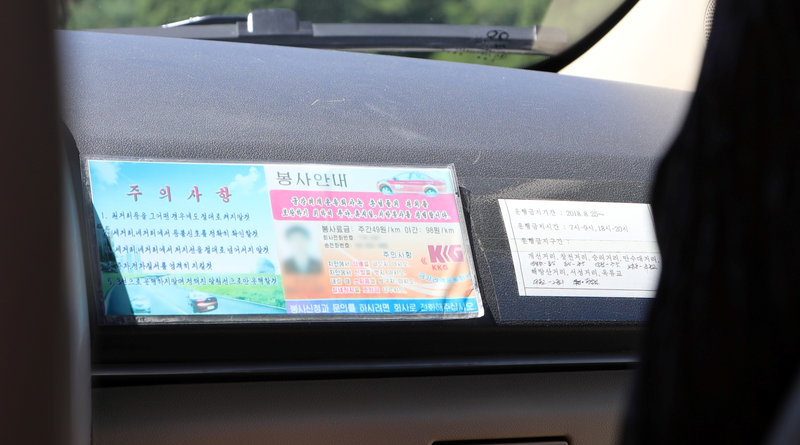 On the dash of this maroon and gold KKG-brand (Korea Kumgang Group or Kumgang Passenger Transport Company in Korean – 금강려객운송회사) taxi is a list of rules: the driver must not use their high beams at any time, must check traffic lights and never cross the line on red lights at all intersections, must strictly abide all stopping and parking rules, and never drive in the far-right lane, which is typically reserved for buses and trams. In turn, passengers are not allowed to smoke or take off their shoes inside the vehicle, must take care not to damage the interior, and should be careful not to drop their belongings when exiting. The card also says that "for the customer's convenience, [KKG] operates day and night, on holidays, and outside the city," and they are encouraged to contact the company by phone to reserve a pickup or about any concerns. Prices are listed as 49 KPW per km during the day, and 98 KPW per km at night. Possibly in accordance with the September holiday and surrounding events, a separate piece of paper taped to the dash lists a number of prominent streets and bridges closed to vehicles after August 25 from 7:00-9:00 am and 6:00-8:00 pm. 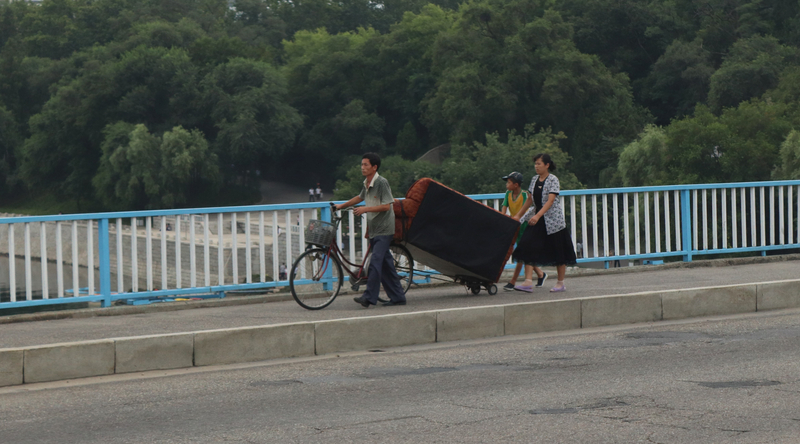 Riding down the street, you may see a scene such as this, where a family has connected a small dolly to the back of a bicycle in order to move a couch, perhaps newly-purchased. Since most families do not own cars, simply dragging large items such as this across town is likely the easiest solution, though delivery services do apparently exist. This is the same brand which was featured in state media last year for apparently developing a soccer video game. Other privileged residents are meeting friends and using their modern smart phones, as this group of young adults take a group photo outside at Ryomyong Street. No finger-hearts here, however. One thing which is not a problem is sharing the road with bicycles, which you typically see riding on the sidewalk. 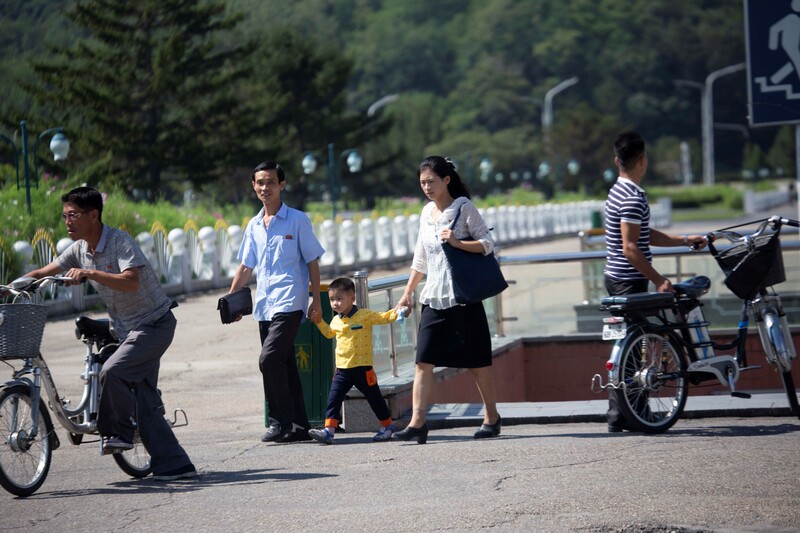 The man on the right, seen preparing to carry his bike down the stairs to the street's underpass, exemplifies the strict adherence of residents to the rules of Pyongyang's relatively calm – but increasingly busier – streets, which seem to dictate riders cannot simply cross whenever they want. 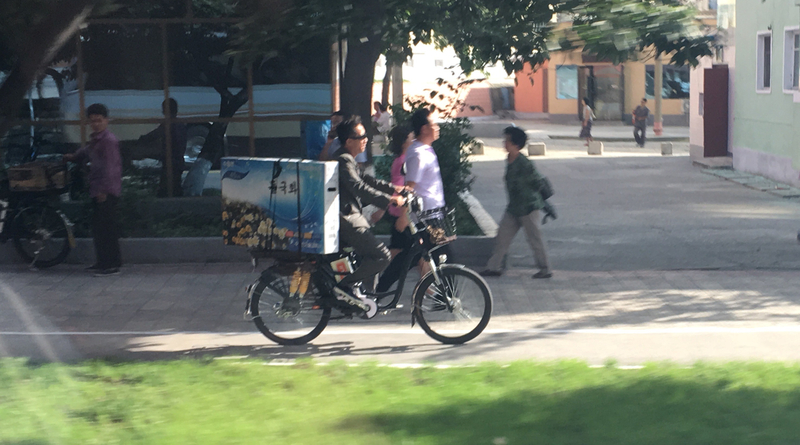 Two Pyongyang residents can be seen using electric bicycles in this photo, and while the vast majority of residents still use traditional bikes, ownership of electric models has been on the rise for the last few years. Another man in the photo is seen carrying a small strapless handbag – a fashion item increasingly popular among men throughout the city, NK News observed. Pyongyang is also known for its clean presentation, where residents are put to work beautifying the city, especially surrounding major holidays. 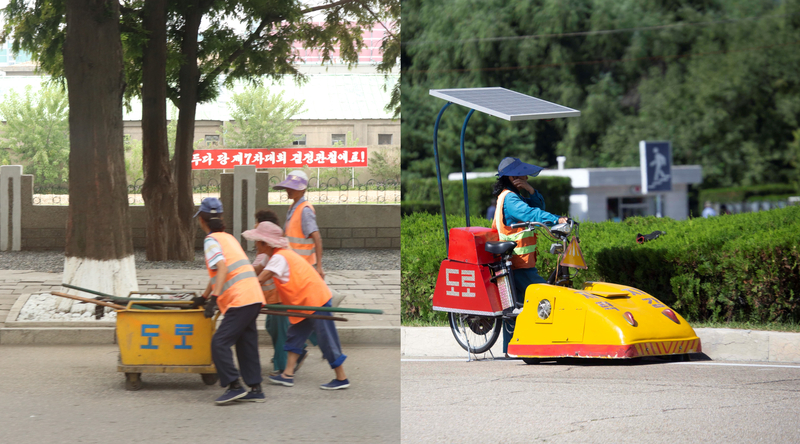 On the left are typical street cleaners in Pyongyang, while on the right is a newer street sweeper electric bicycle, fitted with a solar panel shade. State outlet Sogwang has claimed the new machine was invented by a 37-year-old street facilities management worker from the Rakrang district named Ri Song Ho. On the "hood" of the new machine is the common slogan meaning roughly "self-reliance and self-development" (자력자강). Looking out the window on your way into town, you will also see a few signs bordering on advertisements. 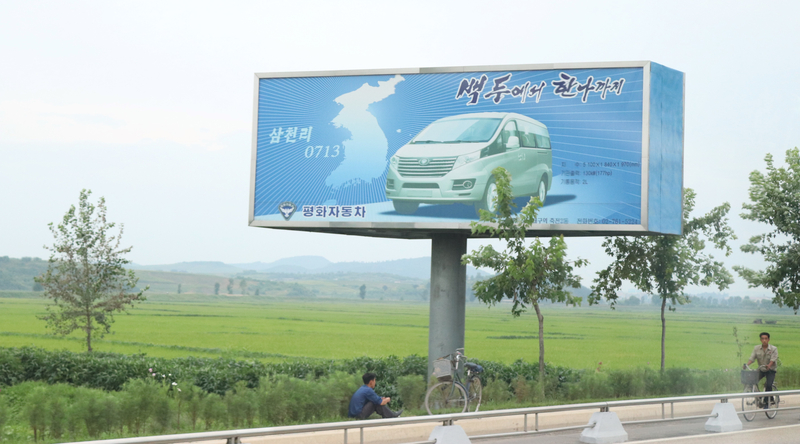 This billboard promoting the Pyonghwa (Peace) Motors Samchonri model van says, "From Paektu to Hanna," using the North Korean spelling for Mt. Halla (Hallasan) on South Korea's Jeju Island. 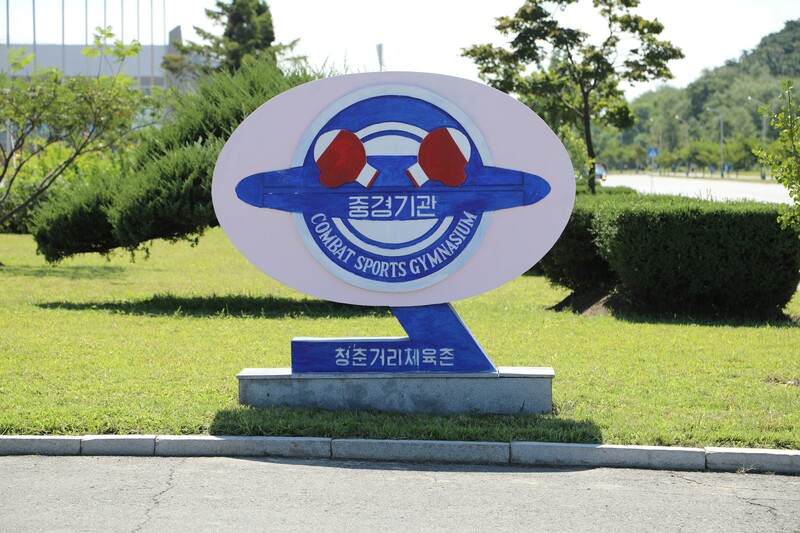 Other signs along the road are not so new, such as this retro hand-painted sign for the Combat Sports Gymnasium at the Chongchun Street Sports Village in west Pyongyang. A new dormitory still under construction at the sports village appeared to be nearing completion this month, as North Korea continues to place strong emphasis on sports as a primary tool of national pride and international recognition. 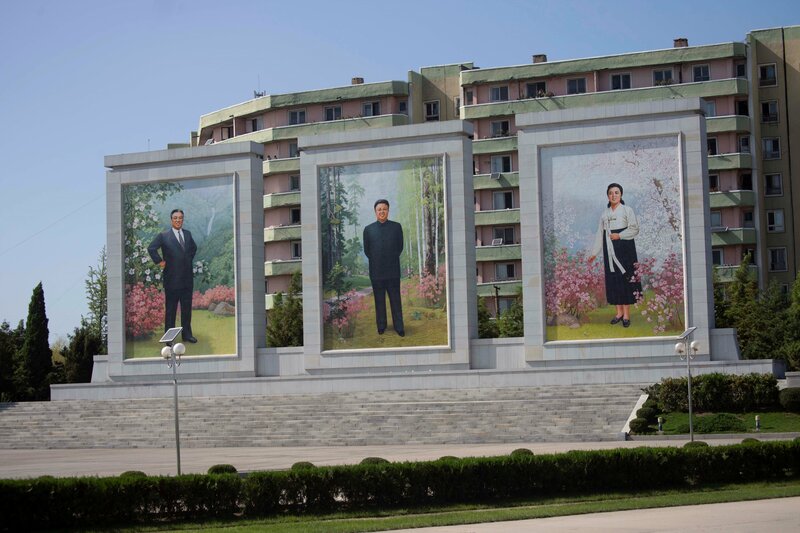 Probably the most common sights along the roads of Pyongyang and the country as a whole are still the portraits and murals of the country's leaders. Here is the North Korean nuclear family in three panels: father and founder Kim Il Sung, son and second leader Kim Jong Il, and "Respected Mother" and "anti-Japanese war heroine" Kim Jong Suk. 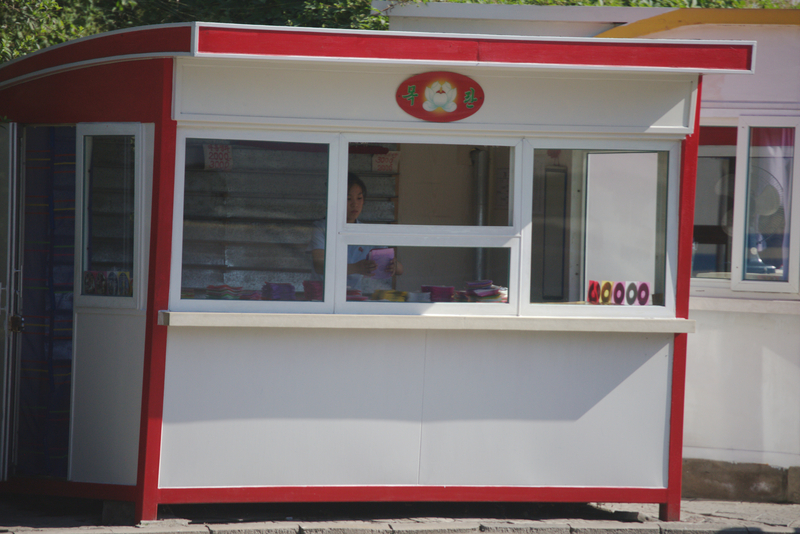 Elsewhere in the city you may run into a Sports Raffle booth like this one run by the Pyongyang Sports Bureau. This raffle or lottery is typically operated to raise money for certain sports events, giving away various prizes instead of money. Ticket prices are not displayed, but the poster says there are two sets of 30,000 tickets available, with both instant prizes and a raffle drawing to be held later. This goal of this raffle was to raise money for the men's Torch Cup football tournament, which had occurred nearly a month prior to this photo being taken. While the final raffle drawing was made on August 15, the attendant still works in the booth here in September. Two lucky first-prize winners in the instant drawing receive refrigerators, two second-prize winners get cell phones, and two third-prize winners get 19-inch LCD televisions. In the raffle, there are two 43-inch LCD televisions, two refrigerators, two phones, two freezers, 36 electric fans, 60 five-liter bottles of soybean oil, 240 umbrellas, 1200 cooking seasoning (packs), 6000 lighters, and 36,000 batteries. Pens, pencils, q-tips, and a random assortment of lighters are displayed in the booth window. 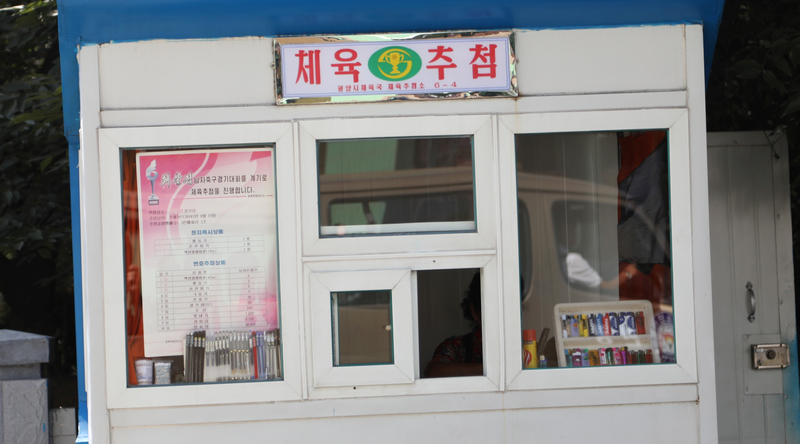 While booths selling drinks and snacks are everywhere in North Korea, some also sell movies under the Mokran Video brand. Mokran is also a television station, which can often be seen playing Disney movies like Aladdin or the Lion King. But they also burn these foreign movies to DVD, and sell them in their self-branded stalls, as photographer and former Pyongyang resident Jaka Parker showed in a 2016 video. A sign on the back wall of this booth says that children's movies cost 2000-3000 won. This is $20-30 USD each if interpreted through the official exchange rate, but only $0.25-0.37 USD in the unofficial but widely-accepted rate. When you make it to the center of town, you can't miss the largest landmark in the city. 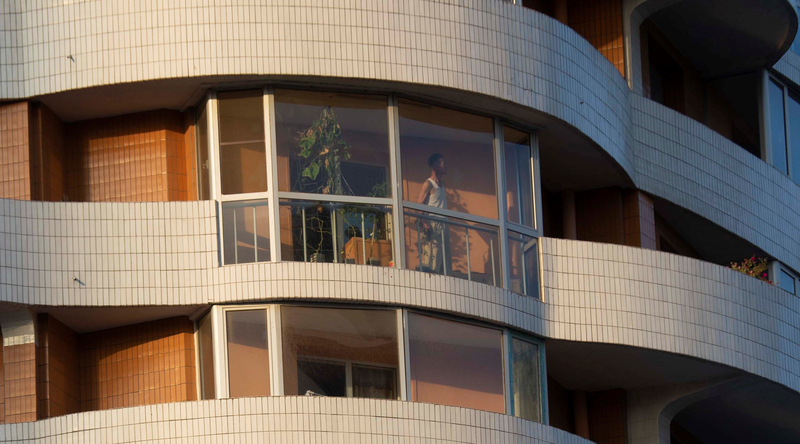 Look up and you may see workers dancing along the edge of Pyongyang's iconic Ryugyong Hotel. 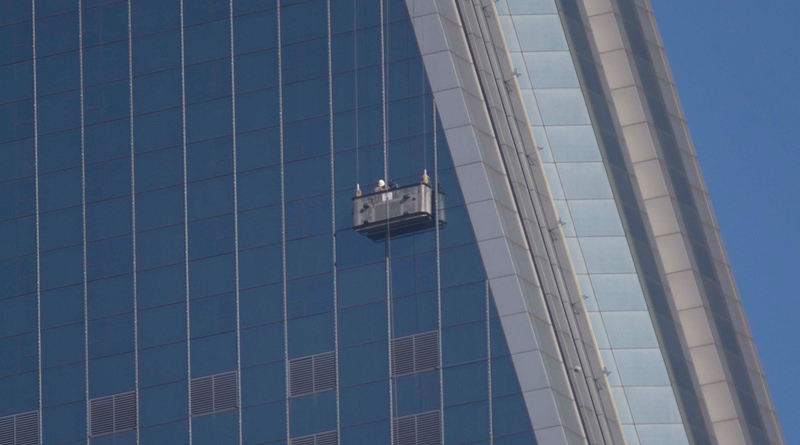 Here, workers are attending to LED light strips, which were newly installed on the building's facade a few months ago to form a large color display. The building was used to project new, 70th founding anniversary-themed animations for the occasion, meaning workers had to make sure there were no problems or dead LED strips. Look up at the buildings almost anywhere in the city and you'll see the creative and economical ways residents use their balcony space. 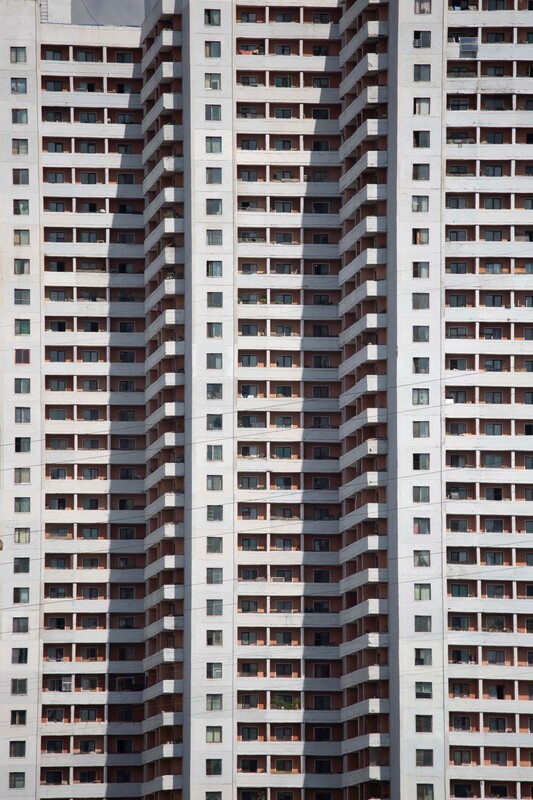 There have been numerous accounts over the years of people raising chickens or other small animals on their balconies in Pyongyang, building makeshift shelters to use some or all of the space. This appears evident in this photo, where dozens of balconies on one side of this building (click here for full size image) appear with wood coverings connecting the balcony edge to the door at a 45-degree angle. 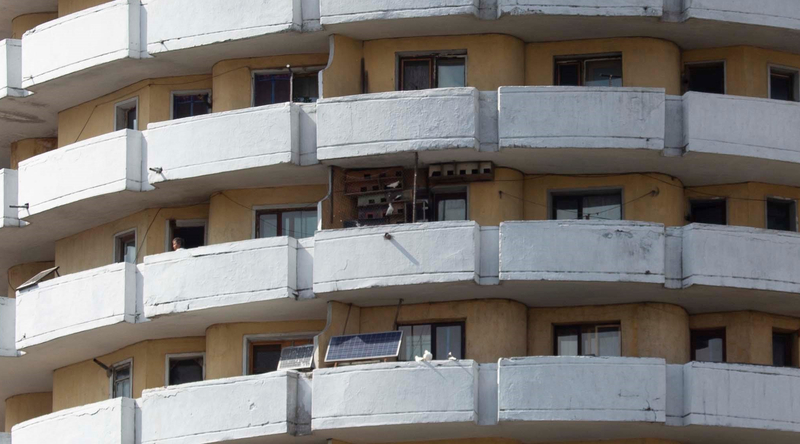 There are also the now-ubiquitous solar panels in Pyongyang, seen in various creative positions in this image, as reliable central power remains an issue for most residents. If raising birds isn't your thing, you could always just house them: a resident in this image keeps a large array of birdhouses on their balcony. This is not an uncommon sight in Pyongyang. 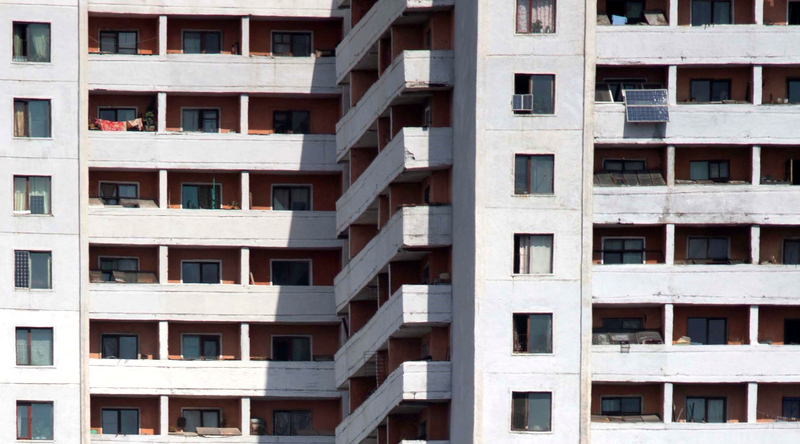 Find yourself on Ryomyong Street – the newest major political project of Pyongyang – and you will still see personalized balconies, only here they are perhaps a bit neater. But many of the new skyscrapers here remain only partly-occupied, and electricity is reportedly not reliable in this "upscale" area. From the balcony, on the other hand, you may see scenes such as this. 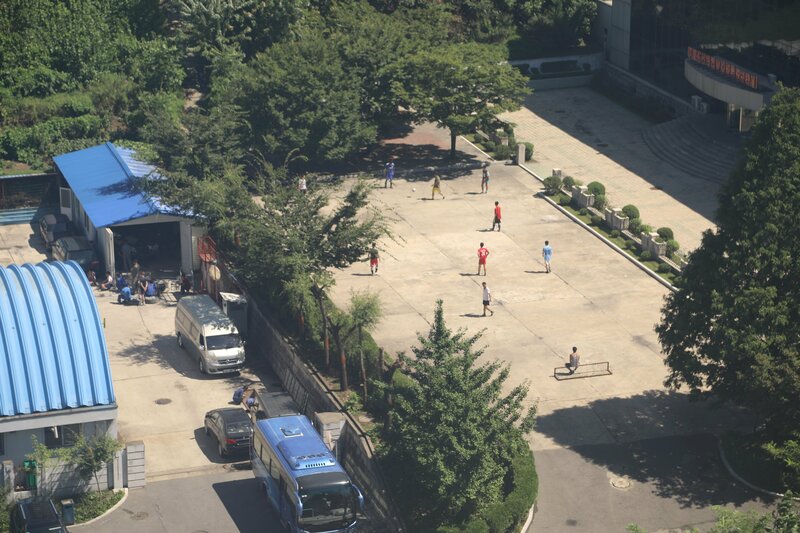 A building with a typical propaganda slogan praising Juche and Kim Jong Un, some men playing a game of street soccer, and workers at a vehicle repair yard working and resting in the shade. Now, after the major events of September have passed, the residents will try to enjoy the good weather before winter sets in.